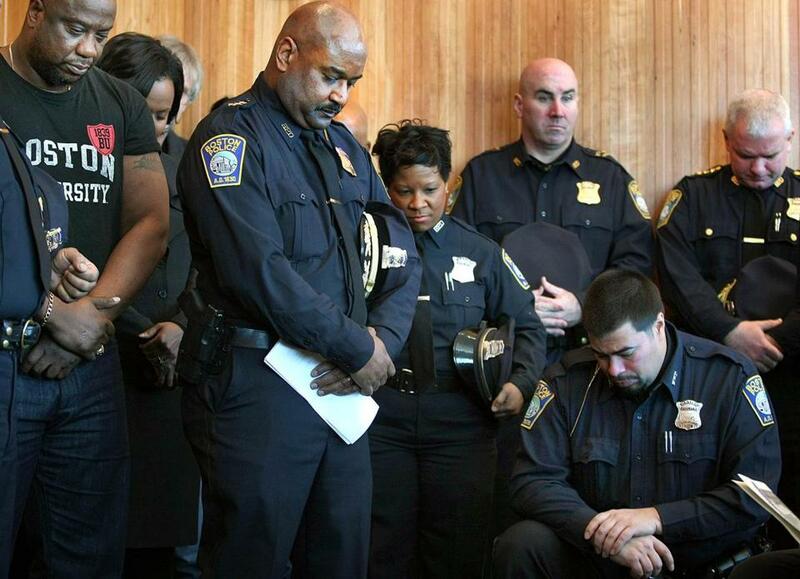 Police officers bowed their heads during a prayer after the ceremony naming a room in the Dudley Square station for Sergeant Horatio J. Homer, the city’s first black officer. Boston police Deputy Superintendent Randall Halstead said he walked into the community room in the new Dudley Square station in 2011 and immediately knew it should be dedicated to the first African-American patrolman in the city. “You walk in here and you just feel something,” Halstead said. “This had to be for him.” The room, which overlooks the square in Roxbury, was dedicated Saturday afternoon to the memory of Sergeant Horatio J. Homer with a plaque and a brief ceremony. Homer served in the Boston Police for more than 40 years, starting as a Back Bay patrolman in 1878. “The man lived in this district,” Halstead said. “I always wanted Sergeant Homer to see the development of Dudley . . . to watch the sun rise, and watch the sun set.” There are people today in this city . . . that are carrying out the legacy of Horatio Homer.’ Boston Police Commissioner Edward F. Davis said preserving Homer’s legacy is important to the department. “There’s something about naming a room in the middle of Roxbury, in a very busy department that serves our African-American community,” Davis said. 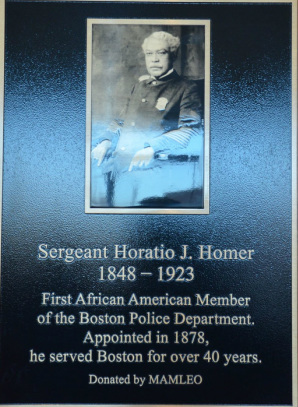 “There are people today in this city, in this very district, that are carrying out the legacy of Horatio Homer.” Boston police hired five more black men in the late 19th century, largely because of Homer’s recommendations. Still, complete integration was not instant: Homer became the only black officer on the force again by 1903, and the department did not hire more officers of color until after the police strike of 1919, months after Homer retired.